Records the state for the renderer. Creates a new renderer with both lines and shapes visible. Draws the first pass shape. Draws the item (first pass). Draws the item shapes and adds chart entities (second pass). Returns the base 'lines visible' attribute. Returns the base 'shape filled' attribute. Returns the base 'shape visible' attribute. Returns true if outlines should be drawn for shapes, and false otherwise. Returns a flag that controls whether or not each series is drawn as a single path. Returns the flag used to control whether or not the shape for an item is visible. Returns the flag used to control whether or not the shape for an item is filled. Returns a legend item for the specified series. Returns the shape used to represent a line in the legend. Deprecated. As of 1.0.7, use the per-series and base level settings. Returns the number of passes through the data that the renderer requires in order to draw the chart. Returns the flag used to control whether or not the lines for a series are visible. Returns the flag used to control whether or not the shapes for a series are filled. Returns the flag used to control whether or not the shapes for a series are visible. Returns true if the renderer should use the fill paint setting to fill shapes, and false if it should just use the regular paint. 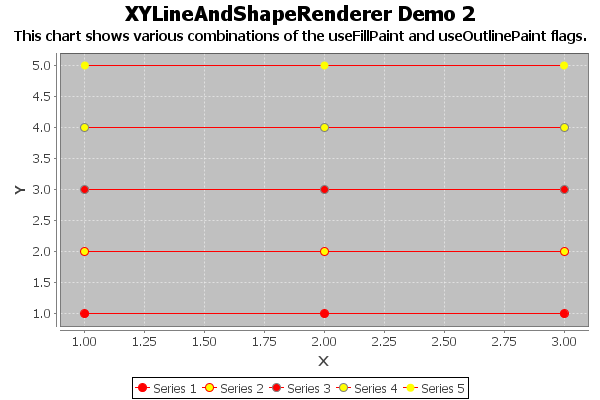 Returns true if the renderer should use the outline paint setting to draw shape outlines, and false if it should just use the regular paint. Returns true if the specified pass is the one for drawing items. Returns true if the specified pass is the one for drawing lines. Sets the base 'lines visible' flag and sends a RendererChangeEvent to all registered listeners. Sets the base 'shapes filled' flag and sends a RendererChangeEvent to all registered listeners. Sets the base 'shapes visible' flag and sends a RendererChangeEvent to all registered listeners. Sets the flag that controls whether outlines are drawn for shapes, and sends a RendererChangeEvent to all registered listeners. Sets the flag that controls whether or not each series is drawn as a single path and sends a RendererChangeEvent to all registered listeners. Sets the shape used as a line in each legend item and sends a RendererChangeEvent to all registered listeners. Sets the 'lines visible' flag for a series and sends a RendererChangeEvent to all registered listeners. Sets the 'shapes filled' flag for a series and sends a RendererChangeEvent to all registered listeners. Sets the 'shapes visible' flag for a series and sends a RendererChangeEvent to all registered listeners. Sets the flag that controls whether the fill paint is used to fill shapes, and sends a RendererChangeEvent to all registered listeners. Sets the flag that controls whether the outline paint is used to draw shape outlines, and sends a RendererChangeEvent to all registered listeners. Returns the number of passes through the data that the renderer requires in order to draw the chart. Most charts will require a single pass, but some require two passes. Returns a flag that controls whether or not lines are drawn for ALL series. If this flag is null, then the "per series" settings will apply. Sets a flag that controls whether or not lines are drawn between the items in ALL series, and sends a RendererChangeEvent to all registered listeners. You need to set this to null if you want the "per series" settings to apply. Sets a flag that controls whether or not lines are drawn between the items in ALL series, and sends a RendererChangeEvent to all registered listeners. flag - the flag (null permitted). The legend line (never null). line - the line (null not permitted). The default implementation passes control to the getSeriesShapesVisible method. You can override this method if you require different behaviour. Returns the flag that controls whether the shapes are visible for the items in ALL series. Sets the 'shapes visible' for ALL series and sends a RendererChangeEvent to all registered listeners. The default implementation passes control to the getSeriesShapesFilled method. You can override this method if you require different behaviour. Sets the 'shapes filled' for ALL series and sends a RendererChangeEvent to all registered listeners. filled - the flag (null permitted). In some cases, shapes look better if they do NOT have an outline, but this flag allows you to set your own preference. Refer to XYLineAndShapeRendererDemo2.java to see the effect of this flag. This method will be called before the first item is rendered, giving the renderer an opportunity to initialise any state information it wants to maintain. The renderer can do nothing if it chooses. Draws the item (first pass). This method draws the lines connecting the items. Draws the item (first pass). This method draws the lines connecting the items. Instead of drawing separate lines, a GeneralPath is constructed and drawn at the end of the series painting. Draws the item shapes and adds chart entities (second pass). This method draws the shapes which mark the item positions. If entities is not null it will be populated with entity information for points that fall within the data area. crosshairState - the crosshair state. entities - the entity collection. datasetIndex - the dataset index (zero-based). A legend item for the series. java.lang.CloneNotSupportedException - if the clone cannot be created.